Well, you could make this with frozen or canned corn, but it’s SO much better with fresh, and that’s SO easy to get right now that there’s no excuse. 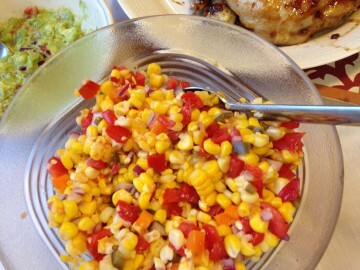 This is a very easy dish to make, especially if you have a “corn zipper” tool to remove the corn from the cob. Leftovers will last about a week in the fridge. Double the recipe if you’re serving a lot of people or taking this dish to a potluck. Put it in the microwave, husks, silks and all, and nuke for 4 minutes at high for one ear or 8 minutes for two (don’t cook more than two at a time). When it’s done, cut about an inch off each ear above any stalk on the bottom. Then, starting at the top of the ear, squeeze gently and the corn will slide right out of the husks, without any silk (or very little) attached. You will probably need a potholder to do the squeezing, because the ear will be quite hot. Allow flavors to mingle for at least 20 minutes before serving.